Cheshire cleansing are professional Exterior Cleaners. Specialising in Driveway and Patio Cleaning and Repairs. Based in East Cheshire and coming from the building trade. It was clear that starting up a pressure cleaning business was the right thing to offer out. A one stop shop for cleaning and repair work. 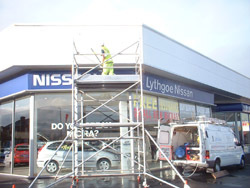 We have built our business up through reputation being professional Exterior Cleaners has lead to most of our work been repeat business offering maintenance along side this is why we are used by so many property letting firms in the area. Reviving years of neglect, Dirt, Grime, Moss, Algae, can all be cleaned from your driveway, paths, patios or complete house.